FitnessLance is the PUP that uses misleading techniques to prevent removal. Use Reimage to locate malicious components and get rid of them faster than with uninstall instructions. A full system scan blocks virus reappearance and prevents traffic to malicious domains. FitnessLance virus. Is it dangerous? How does this adware spread? How to remove FitnessLance adware? When compared with ransomware-type viruses and similar cyber threats, FitnessLance virus may seem harmless. According to PC security experts, it should be categorized as “adware”. Nevertheless, this program can still lead you to various problems and may seriously affect your browsing on the Internet. For example, Fitness Lance may cause misleading pop-up ads during each of your search sessions, track your activity on the Internet, redirect you to suspicious websites and so on. The real aim of this application is to promote affiliate parties and help its developers collect income. So, if you have already added this extension to your browser, make sure you remove FitnessLance from your computer without wasting your time. The first and most important thing you should know about this PUP is that it serves misleading ads. Take note that it serves not only fitness and healthy lifestyle related ads, but also various shopping offers, including coupons, price comparisons and so on. These advertisements are supposedly meant to help you save time and money by bringing all the best offers directly to you. Do not let your curiosity take over and do not click on FitnessLance ads! They are designed to attract user’s attention and tempt him/her to click on them. Do not do it, unless you want to visit untrustworthy and possibly malicious Internet sites. These advertisements look great, but in reality, they are used as a bait for the user. They carry links that lead users to predetermined third-party web pages that belong to developers of FitnessLance virus. Please, do not risk clicking on these ads, because you can never know what website you can end up on. Some of them might be safe, but others can be malicious. Other question that matters is how these ads manage to deliver such attractive content? It even seems that FitnessLance adware knows what interests you. In fact, it does, because it tracks your browsing activity. Once installed, it adds tracking cookies to your web browser and puts you under supervision. It collects your search queries, memorizes what websites you visit and what ads or links do you click on. Based on such information, it easily generates targeted ads for you and causes FitnessLance redirect once you click any of these pop-up messages. As we have already stated, you should not click on these ads, no matter how beneficial they look. If you are dealing with this adware, you should waste no time and remove it from your computer. You can run a full system scan with Reimage anti-spyware program and remove FitnessLance automatically OR can find a manual FitnessLance removal guide on page 2. FitnessLance has an official website, and you can download this software from it (the executive file is named FitnessLance_Setup.exe). Just like the majority of PUPs, it usually enters victims’ computers alongside freeware and shareware. Therefore, you must be cautious when installing free programs, especially the ones you download from questionable download sites online or file sharing networks. Do not make the same mistake the majority of computer users do – do not rush through the installation process and do not rely on Default or Standard installer’s settings if you want to avoid FitnessLance hijack! Bear in mind that by selecting these settings you agree to install all additional components added to you preferred software. To see these components and to opt them out, choose Advanced or Custom settings. We cannot find a single positive feature of this ad-supported program. 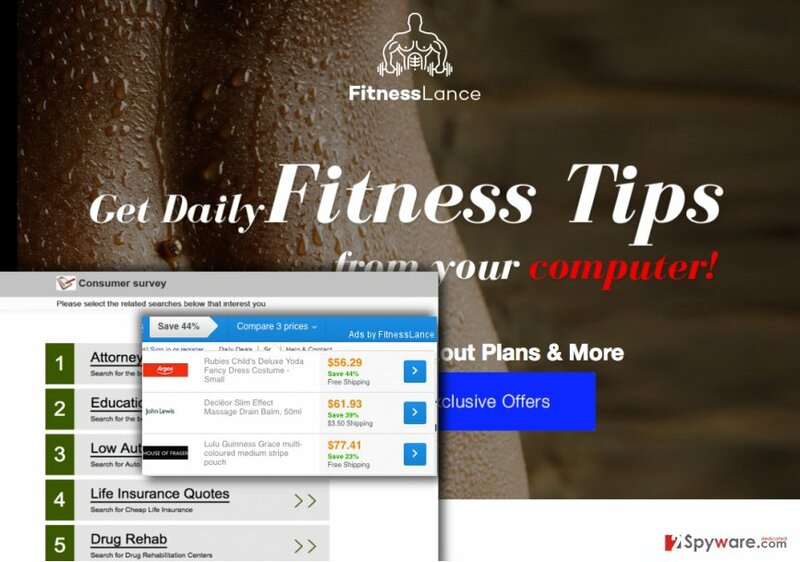 Ads by FitnessLance are annoying and useless, so there is no point of keeping it installed on the computer. You should not worry about FitnessLance removal because it is quite easy to remove this ad-supported program manually. We have provided an informative step-by-step adware removal guide below, so you just have to follow each step and do everything as instructed. However, if you cannot remove FitnessLance virus manually, we advise you to assign this task for a powerful anti-spyware software. We also recommend keeping such software on the computer because it can protect your computer and files stored in it from critical computer viruses. Here, look for FitnessLance or any other recently installed suspicious programs. Wait until you see Applications folder and look for FitnessLance or any other suspicious programs on it. Now right click on every of such entries and select Move to Trash. When in the new window, check Delete personal settings and select Reset again to complete FitnessLance removal. Once these steps are finished, FitnessLance should be removed from your Microsoft Edge browser. Here, select FitnessLance and other questionable plugins. Click Remove to delete these entries. Now you will see Reset Firefox to its default state message with Reset Firefox button. Click this button for several times and complete FitnessLance removal. Here, select FitnessLance and other malicious plugins and select trash icon to delete these entries. Click Reset to confirm this action and complete FitnessLance removal. Here, select Extensions and look for FitnessLance or other suspicious entries. Click on the Uninstall button to get rid each of them. Now you will see a detailed dialog window filled with reset options. All of those options are usually checked, but you can specify which of them you want to reset. Click the Reset button to complete FitnessLance removal process. This entry was posted on 2016-04-22 at 00:54 and is filed under Adware, Viruses. You can quickly scan the QR code with your mobile device and have FitnessLance manual removal instructions right in your pocket. How did you remove FitnessLance?